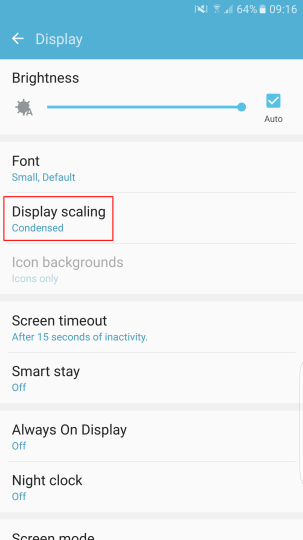 If you have recently updated your Galaxy S7 or S7 Edge to the latest version of its firmware, then you can now officially scale your smartphone's display. There was a public discussion regarding the feature lately and not long after, it has been made available within the Settings menu, under the Display tab. Many consider this feature to be incorporated in the next iteration of Android (Android N) and thus it could be a taste of things to come. The display-scaling feature isn't really ground-breaking but it does have its uses. The basic idea behind the setting is that it allows users to choose the amount of condensation in terms of DPI. The higher the condensation, the more amount of content can be seen on the display of your S7 or S7 Edge. As of now, you get the option to choose between either Condensed or Standard. This fresh addition is a part of Samsung's new outlook towards their business. In some of their executive's own words, the Korean giant is trying to act more like a new startup business rather than an old and established MNC. If the new updates and features from their revamped software department is any indication of what's to come, then this is probably a good time to be a loyal Samsung customer.